Today I've published the KinectMultiTouchDevice class on CodePlex. 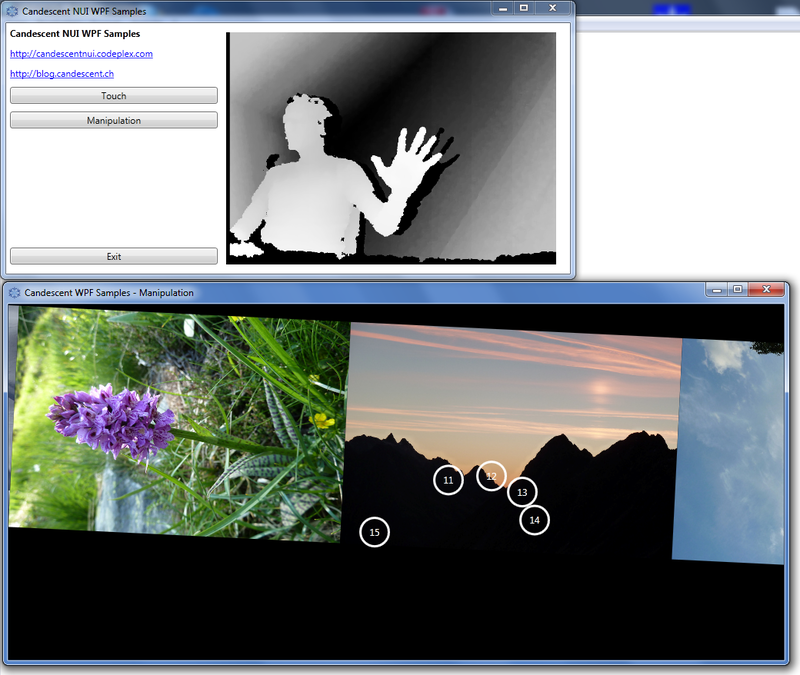 It allows you to leverage the multi-touch support added by Microsoft to WPF 4 and combining it with Kinect! (Here's an introduction blog post that covers much of multi-touch in WPF 4). The update comes with two simple WPF samples in a new Candescent NUI WPF Samples project. It also works with the WPF samples of Microsoft Surface 2.0 SDK, but you'll have to add the KinectTouchDevice for each demo project manually. All fingers of both hands can be used simultaneously. Though it rarely makes sense to use more than 1 or two per hand. Please note: I've only published the source code, I'll add a binary release soon. The sample only runs with OpenNI for the moment. The class CCT.NUI.Touch.KinectMultiTouchDevice can be found in the CCT.NUI.HandTracking.dll. In a WPF 4 window it can be initialized like this (in the loaded event, you must should not add this code in the constructor). The device identifiers are created the following way: The ID is always a 2 digit decimal number where the first number is the hand ID and the second number the finger ID. Finger IDs are assigned in order of appearance and do not identify a specific finger (for example index). There are some glitches here and there, I'll keep working on it. For now I'm looking forward to see what you'll do with it! Hands and fingers are mapped between two frames and keep the same ID until they disappear. IDs are reused! That means if Hand 1 is removed from view the next hand that appears will get ID 1 again. The same is true for the fingers. Finger points get IDs. They are assigned in order of appearance, so you can't assume that 1 is always the thumb. Also the IDs are reused. I'd need some more information to be able to help you. i get this error Unable to find an entry point named 'xnInitFromXmlFileEx' in DLL 'OpenNI'. then i changed the OpenNI version and it worked. amazing, I cannot wait to test it. Error 1 Error generating Win32 resource: Error reading icon 'C:\PATH\CCT.NUI.Samples\organizer.ico' -- The system cannot find the file specified. You're right, the icon was missing. Please try changeset 9489, it should work now. You mentioned above that you could add Kinect touch input to the Surface Demo examples by manually adding a KinectTouchDevice to the project. I tried using your code above but was getting errors. this.factory and this.multiTouchDevice were unrecognized despite having referenced CCT.NUI.HandTracking, CCT.NUI.Core, CCT.NUI.Touch, and OpenNI. But the VS 2010 Express tell me that I miss the Microsoft.VisualStudio.TestTools.UnitTesting. VS Express does not support Microsofts Testing Framework. You can remove the test project from the solution, the rest should work. I'm studing your application and I have a question: it's possible using the SDK skeleton tracking for having hand data instead of using OpenNi hand tracking? And do you know if it's possibile use the skeleton joints as touch controls? Thanks in advance, Deby. Out of the box no, but it would not be too hard to modify the code to use an area around the hand joint for finger detection. But the thing is that skeleton tracking works best if you're 2 meters away from the device while my hand detection only works up to 1 meter (maybe a little more).